As our series on org culture continues, its time to raise the bar in our thinking. Imagine an overlay of the many cultural dimensions of Edgar Schein onto the four primary cultural forces of Charles Handy. The plot thickens: these are conditions present in virtually all organizations. Large orgs have many, diverse subcultures, making cause and effect of broader organization behaviors elusive. The many variables drive an unpredictable dynamic. Traditional OD interventions often take on issues or interventions one by one, in an effort to simplify. But this simply leaves prevailing forces intact. It’s a complex but common situation, and for most, it’s hard to imagine how to deal with it. As we said in our framing post, that’s why org and culture change efforts often struggle or fail. The key focus: complexity, and how it impacts culture change in large organizations. What, Where and When (defining: the “containers”). Must focus on the problem scope or domain that bring a group of people together at a point in time. Many contexts are possible and potentially meaningful, but to achieve a result, one must be picked for focus, to produce a tangible result. More simply, if its a “box within a box” world, which box are we working on right now? Who (defining: the “differences”). Ideally, members of a group will be diverse in their thinking. This brings strong creative energy via opposing viewpoints. Each member can be a catalyst. Bringing members in contact helps them to see alternatives and challenge the status quo. This is essential, and often impossible in Handy’s ‘role/silo’ culture. How (defining: the “exchanges”). Ensuring an efficient means for interaction is key, including face to face conversation and electronic connections. How and why will people in this problem space connect? What is the currency of their interaction? Again, difficult in a ‘role/silo’ world. I see these as the critical building blocks for framing (and ultimately, teaching) collaborative behaviors. And from this conceptual framework, some useful and practical insights have already emerged. 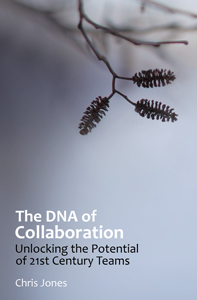 Patterns are outcomes that result from adaptive group collaboration. It is important to reinforce (and thus, reproduce) the positive patterns, and stop the negative ones. Simple Rules are the basis for guiding behavior, which can be done by selecting valuable patterns and reinforcing them (eg. corporate “guiding principles”). These must be actions, starting with a verb. Generative Engagement (aka “productive outcomes”) may be the holy grail in this thought process for OD. It is the way to tap value from the theory, as teams model desired behaviors from the organization, and adopt simple rules. Over time, the theories go, the organization adopts the best, most valuable behaviors, learning to follow useful patterns. There is more engagement. Good things happen. The organization learns, adapts, and becomes more effective. If you’re an OD professional, this should be resonating a bit. As a simple example, cross-functional problem-solving teams can accomplish much using this model. But an even more specific example is a special case: online social communities like #smchat and #ecosys. The diverse thinking of such a group tends to challenge established norms. There is no pre-existing structure to unwind. Innovation can commence as soon as the simple rules are established. The group creates its own situational context, and develops its own specialized, often highly productive method for exchange of ideas. In complexity terms, we call this “self-organizing”. It is a powerful way for groups to spawn new, emergent results. That’s a fancy name for innovation. Seeking to Understand Optimal Conditions. Creating optimized, cross-functional discovery teams is a great way to demonstrate and model effective collaboration. They function best in Handy’s “task/network” model. They are designed to adapt, as members learn from interacting with others, tapping their collective base of experience. And they quickly grow adept at pursuing only patterns that produce desired results. Quite literally, they learn. Without such dynamics, the hardened status quo of the “role/silo” culture prevails, restricting exchange, and providing insufficient diversity of thinking to move beyond the status quo. Thus in traditional structured, top-down groups, innovation can easily be shut down. In groups that understand and build energy from complexity science and the HSDI framework, innovation can flourish. The “Learning Organization” is a future state imagined by Peter Senge in Fifth Discipline (1990). His systems thinking concepts assumed more structure, but his vision of what is possible is congruent with what I’ve outlined here. We are working in the same direction. Where Senge left open the “how”, Eoyang and others at HSDI are applying complexity science to get there. The rest is up to us. When we’ve connected the dots on the core elements of organization and culture change (as we’re doing here) we can move more swiftly to pilot implementations. Next, I’ll post on implications of Culture Change in Government and will update Kotter’s “8 interventions” to account for 21st century forces of increased complexity. Meantime, your insights are, as always, greatly appreciated.